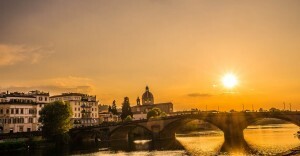 About 50% of the tourists in Florence rightly visit the Uffizi Gallery, an incredible museum that contains a gorgeous collection of paintings, representative of five centuries. What they don’t know is that they’re missing on some masterpieces that would certainly deserve a place of honor even in the famous Gallery. 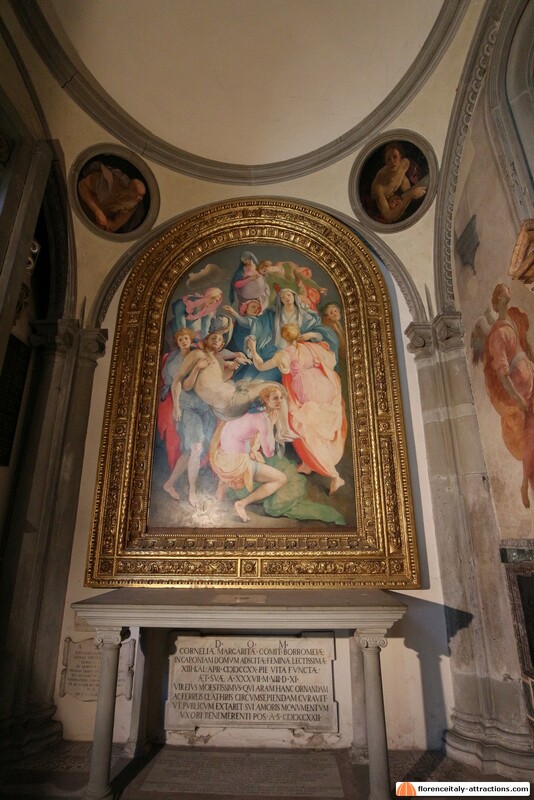 One of these is Pontormo Deposition in the church of Santa Felicita. Jacopo Carucci, simply known as Pontormo, was one of the painters that marked the end of the Renaissance to start a new trend: the Mannerism. Overshadowed by his contemporary Michelangelo, solitary and mournful, Pontormo never left Florence. That’s why he’s not as famous as he would deserve. The quality of his work is not only exceptional, but also something revolutionary: the art of painting was not the same after Pontormo. Pontormo Deposition (1526-28) is probably the highest point reached in his career. So many people covers the small distance between Pitti Palace and Ponte Vecchio, without realizing that close to the bridge, in a small square, stands a church, Santa Felicita, whose facade is almost entirely covered by the Vasari Corridor. 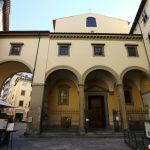 If you just have some minutes, please enter in this ancient church and look at the chapel immediately to right: there is Pontormo Deposition. Traditionally, the deposition describes the act of tearing off Jesus Christ from the cross, after the crucifixion. The scene in Pontormo Deposition is unprecedented. The cross is not in the painting, that probably represents the transport of the body of Christ to the Sepulchre. 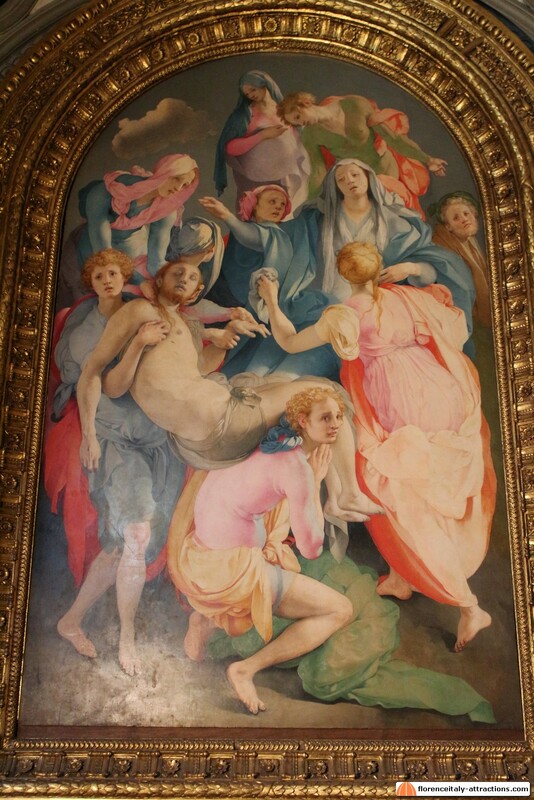 The setting of the scene looks unnatural if compared with the Renaissance tradition: with no perspective references, Pontormo Deposition is crowded of the bodies of the characters. The body of Christ and the two young people supporting him are hit by a strong light, which leaves in the shadows the other figures and ends in the darkness of the background. The bright colors are similar to Michelangelo’s Doni Tondo. Color combinations change continuously from warmer to colder tones. The set of colors is alive, clear and intense, possibly not suitable for this sad event. Many colors are hard to describe: pink salmon, emerald green, many different blue, yellow, orange, red and so on. The painting has all the features of Mannerism. The event is not included in an architectural space perspective that would set it in a real environment; the composition does not have stable reference points; the light and shade is almost absent and does not give volume to the bodies, which are extended in a disproportionate manner; unnatural colors transport us to an unreal dimension, summarized by the air of indifference of the character on the left. The altarpiece looks even more out of place if you consider that it stands inside one of the geometrically perfect architectures by Filippo Brunelleschi, the Capponi Chapel, built around one century before Pontormo decorated it with the Deposition altarpiece. 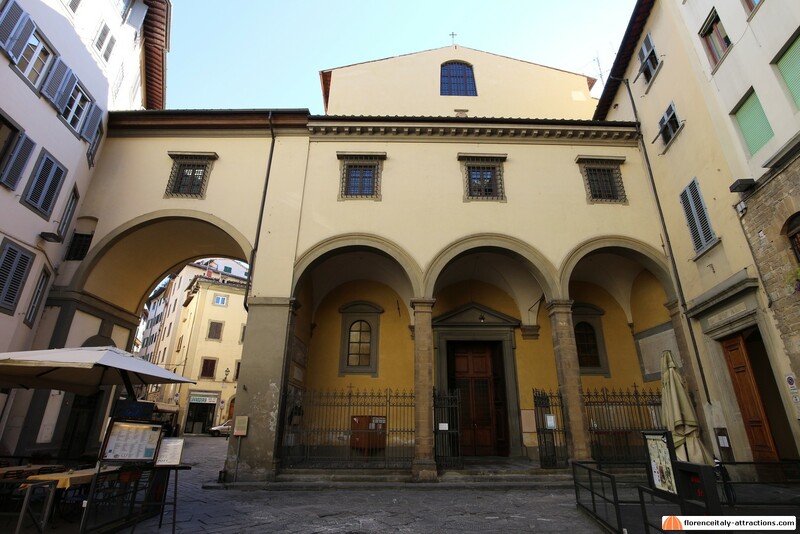 Brunelleschi’s architecture speaks of logic and certainty: a measurable, safe space. 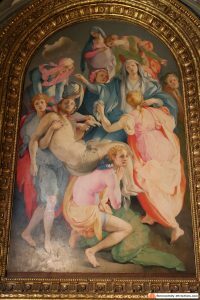 Pontormo Deposition speaks of a dramatic tragedy, with all the bodies piled in the composition. 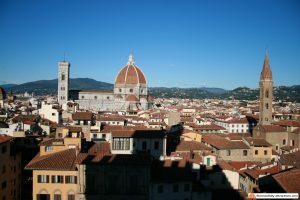 The contrast, well visible, reflects not only the different personality of the two artists, but also the different conditions they were facing in their life: Brunelleschi lived in a period when everything seemed possible for Florence, even challenging the ancient Athens or Rome; Pontormo lived in a period of decadence for Florence but also for the Catholic church, when the Protestant reformation and the Catholic reaction mined many of the absolute certainties that were the foundation of the Renaissance society.